When the Let's Lunch team posted their topic for this month 'Eat your Vegetables' in celebration of the launch of Joe Yonan's new book I was not sure where to start then Sydney's winter weather suddenly turned cold and wet....so what better than create a soup close to my heart. When I was a young girl winter always meant a big pot of borscht would be cooking....be it at home or my Baba's place... and it still instills a comfort that no other soup can replace. Borscht may be a staple national dish in Ukraine every region and every home has their own 'special' recipe. Some are full of beetroot, others more carrots and cabbage, some have lots of tomatoes and only a little beetroot, some add pork, beef brisket, smoked pork sausage or speck, some add beans and others add barley.....though my Baba would always keep beetroot the hero. A few little tips my Baba taught me were to initially cook the beets separately, then chop them and toss them in vinegar to keep their colour and add a little more vinegar just at the end which gives the soup a little tart zing that lifts the soup to a whole new level. My baba would make her everyday borscht with her homemade pork rib stock that had been simmering for hours....however in keeping with the Let's Lunch theme, and in the name of speed, this creation is 'purely' vegetarian. Place the beetroot in a large saucepan. Cover with cold water. Bring to the boil over medium heat. Reduce heat to low and simmer for 30-40 minutes or until tender. Drain. Set aside to cool slightly. Peel beetroot (it will easily peel off but prevent your hands becoming stained a vibrant pink I suggest using some kitchen or disposable gloves). Thinly slice the beetroot , then cut into thin strips. Place in a large ceramic or glass bowl. Pour over 1 tablespoon of vinegar. Toss to combine. Set aside. Heat oil in a clean large saucepan over medium low heat. Add onion, carrots and celery. Cook, stirring regularly, for 10 minutes or until softened. Add tomatoes and cook,stirring occasionally, for 3 minutes. Add beetroot mixture, potato and stock. Bring to the boil. Reduce heat to low and simmer for 10-12 minutes or until potato is almost tender. Add cabbage and cook, stirring occasionally, for 15 minutes or until cabbage is tender. Stir in the remaining vinegar. Season to taste with salt and pepper. Stir in half the dill. Remove from heat and set aside for 5 minutes. Divide among serving bowls. Top with a dollop of sour cream and garnish with remaining dill. I’ve posted a link below to everyone else's #LetsLunch posts for this month and will continue to update them as they come in. What a healthy food. 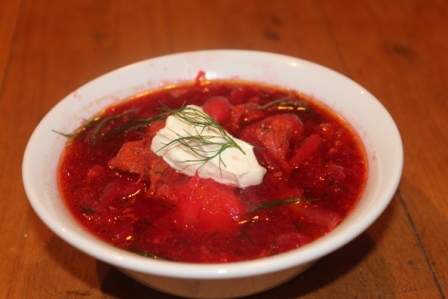 I love to try this Ukrainian Vegetarian Borscht.